Getting kids to eat healthy food is a challenge you can make fun. The key is to help them enjoy what they’re eating. With fruits and vegetables coming in a huge variety of colours, shapes, smells and flavours, it can be easy to get even fussy eaters interested. Read on for some tips on how to establish your kids eating habits early and make sure that they're healthy. I sincerely hope some of these suggestions for getting kids to eat healthy food can help you, especially if you're already feeling frustrated. I know from experience that mealtimes can become the most dreaded part of the day. It's important to keep calm and not make too big a deal out of things when your kids refuse to eat, as that can create eating problems for them in the future. The medical experts assure parents that if you provide your kids with a variety of healthy food choices, when you average out what they actually eat over a longer period their nutrition levels are usually fine. If you're worried your child isn't growing and thriving see your family doctor. Good luck! If your children are around while you’re preparing healthy meals, let them sample the fruits and vegetables that catch their eye. You don’t have to push it, just set an example and share while you prepare. Fruits and vegetables are delightfully colourful, smell fantastic and come in an enormous range of shapes and sizes. Talk about different fruits and vegetables with your kids. Admire the colours in the skin of an apple. Hold a kiwifruit like a fluffy chick. Smell a melon together to check if its odour is sweet and ripe. Compare the crinkliness of a passionfruit, the dottiness of an orange and the smoothness of a pear. Match the sharper smell of a feijoa with its flavour. Getting kids to eat healthy is made easier when they think it's an exciting game they're playing with you. Chop up fruits and vegetables in unusual shapes. Provide funky shaped or bendy straws to get your kids excited about drinking green smoothies. Arrange fruits and vegetables on colourful plates and bowls into pictures of faces or animals. Provide a variety of fruits and vegetables for your children to experiment with. You may be surprised at what favourites they discover. My son quickly developed a tendency towards blueberries, plums, and creamy home-grown zucchini whilst my daughter craves persimmons, raspberries and snowpeas (grown for her especially by her Daddy!) If you’re shopping for food together, point out unusual fruits and vegetables to your kids and occasionally buy something exotic as a treat. Teach children the names of the different fruits and vegetables they try – knowledge is power to kids. “Na-na” was one of my daughter’s first words, she loves saying “zucchini” and thinks that “broccolini” is just hilarious. One of the benefits of getting kids growing food is that they learn early to value the food cycle, and don’t start thinking food grows on supermarket shelves. Even if you’re not so keen to let your kids into your precious veggie patch, at least let them help you harvest. Getting kids to eat healthy fruits and vegetables straight out of your home vegetable garden makes a direct and strong connection between growing and eating food. Eating food they’ve picked themselves is really exciting for children, and they might even thank you for your hard work in the dirt! Children have so much fun in the kitchen, and it’s a valuable learning time too; reading recipes, measuring, pouring, mixing and timing. They will be proud of the dishes they create and enthusiastic about taste-testing them. Take the time to sit and eat with your children, making meals a social time for exchanging news and telling stories. Kids will be less likely to eat in a rush or be eager to leave the table to get back to more interesting activities. The most interesting event will already be happening at the table with you! Younger ones on the verge of learning to eat independently will sometimes get over their fussiness if they’re allowed to feed themselves. 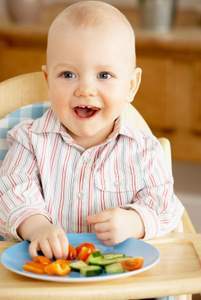 The fascination and fun of using a fork or spoon or even fingers can get small pieces of soft fruit and vegetables into their mouths faster than coaxing. If you’re happy to let your kids graze on healthy snacks, make healthy food accessible so they can help themselves. You can load up a small fruit bowl with washed fruit and vegetables that they can grab and eat, such as apples, bananas, carrots and sweet red capsicums. Have a drawer or large container of chopped fruits and vegetables in the fridge that your children can pick from whenever they like. Small containers of raw hommus or guacamole will encourage them to snack on vegetable sticks with dips. Include some dehydrated crackers or biscuits and some dried fruits. If they’ve grazed so much that they’re not hungry at a formal mealtime then that’s ok, they’re full of healthy food anyway. Try cutting up a small container of fruit and vegetables each morning that you can present with each meal throughout the day. Your kids can gradually eat their way through it, and over time you’ll learn the raw foods they most love to snack on. Include 2-3 fruits or vegetables you know they like and add 1-2 new ones or foods you’re trying to encourage them to eat. This works well if your kids are too young to help themselves to snacks or you’d rather your kids sit up and eat at set mealtimes. Don’t buy food you don’t want your kids to eat. Don’t have it in the house. Don’t eat it yourself, especially not in front of them! An important tip: Keep up your kids’ water intake, even if they’re eating more juicy fruits and vegetables. Their stomachs still need clean water to process the juices and pulps of the food they’re eating. When we get really busy as a family I occasionally overlook this vital component of my kids health, and their stools are quickly affected. Luckily it’s a problem that’s easy to notice and correct, but even better, avoid the problem altogether. 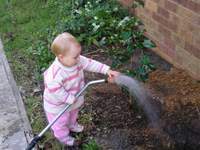 Signs that children need more fluids include yellower urine, being thirstier than usual, less wet nappies (average is 6-8 for babies and 4-5 for older babies and toddlers) or stronger smelling nappies, constipation, tiredness and lethargy, dark circles around their eyes, dry mouth, dry skin, headaches and weight loss. Check this factsheet for more information about children’s daily fluid intake requirements.